Click to view full size cover! The Cult of Alien Gods is available to order from your favorite retailer. "[A] dense yet fascinating read...that seeks to shed light upon a hundred years of speculation and myth, while at the same time paying high praise to one of the last century's greatest storytellers." "...this book should find a place on the shelves of those who enjoy reading about the development of American popular culture during the 20th century..."
"Combining literary theory, cultural criticism and muckraking, Colavito aims to debunk alternative history… He does a fair job of presenting his case, using a great deal of textual analysis… the writing is engaging and the topic intriguing…"
"...work[s] well to place Lovecraft in the forefront of not only popular fiction but also popular culture..."
Nearly half of all Americans believe in the existence of extraterrestrials, and many are also convinced that aliens have visited earth at some point in history. Included among such popular beliefs is the notion that so-called ancient astronauts (visitors from outer space) were responsible for historical wonders like the pyramids. Shocking new evidence proves that the entire genre of ancient astronaut books is based upon fictional horror stories, whose author once wrote that he never wished to mislead anyone. 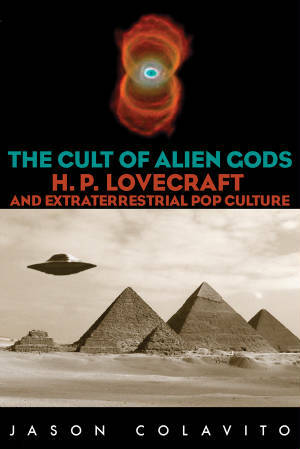 In this entertaining and informative book, Jason Colavito traces the origins of the belief in ancient extraterrestrial visitors to the work of horror writer H.P. Lovecraft (1890–1937). This amazing tale takes the reader through fifty years of pop culture and pseudoscience highlighting such influential figures and developments as Erich von Däniken (Chariots of the Gods), Graham Hancock (Fingerprints of the Gods), Zecharia Sitchin (Twelfth Planet), and the Raelian Revolution. The astounding and improbable connections among these various characters are revealed, along with the disturbing consequences of Lovecraft’s “sheer fun” for modern science and public knowledge. Beyond documenting Lovecraft’s influence on ancient astronaut theories and Raelian cloning efforts, Colavito also argues that the appeal of such modern myths is a troubling sign in an age when science is having its greatest success. He suggests that at the dawn of the 21st century Western society is witnessing a deep-seated erosion of Enlightenment values that are the basis of the modern world. Read the errata for The Cult of Alien Gods here. © 2005-2008 Jason Colavito. All rights reserved.